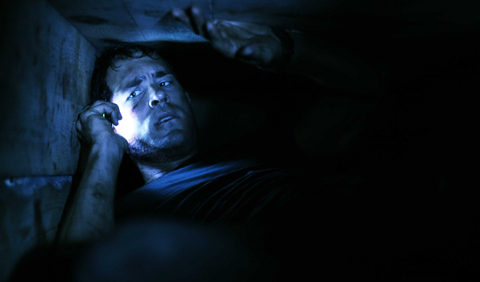 Buried is a movie about a man (Ryan Reynolds) who wakes up buried alive in a coffin. That’s about it. The whole movie takes place in this coffin with him as he tries to figure out why he’s there and how to get out. I like to think of this movie as an art project. Like in public school when your art teacher asked you to complete an assignment where you had a certain amount of limitations (only using watercolours or it has to be on a single 3x3 inch piece of construction paper). The point of these assignments were to have the students think as far outside of the box as they could given their restrictions and to be creative. Then, in the end, most students succeed in meeting the requirements and being creative, but ultimately, these won’t be their favourite projects or ones they’ll try again later. And so is Buried: an incredibly creative project based on a single high-concept premise that thinks outside of its box (pun intended), but in the end is not a movie I ultimately care about. Creativity and intensity are aspects that I value most when watching movies. This one-scene film makes hard attempts at both, but only succeeds partially. It is definitely creative in the camerawork. I mean, how many ways can you possibly film someone in a coffin? And parts of the movie are definitely intense, especially the beginning and ending. Yet these aspects can only go so far. The intensity doesn’t hold up all the way through, and creative camera work can’t save a whole movie. It ultimately becomes too derivative. There is however, fantastic work from Ryan Reynolds since he has every frame of the movie focussed on him. The opening credits are also awesome: they’re designed like the classic opening animated credits of Psycho or North by Northwest. So what does that tell you, when one of the best parts is the opening credits? Summary: While it is creative and delivers intensity by keeping the audience also trapped in the coffin, the movie is essentially just an experiment. It is currently #810 of the 1443 movies I’ve seen on flickchart.com.